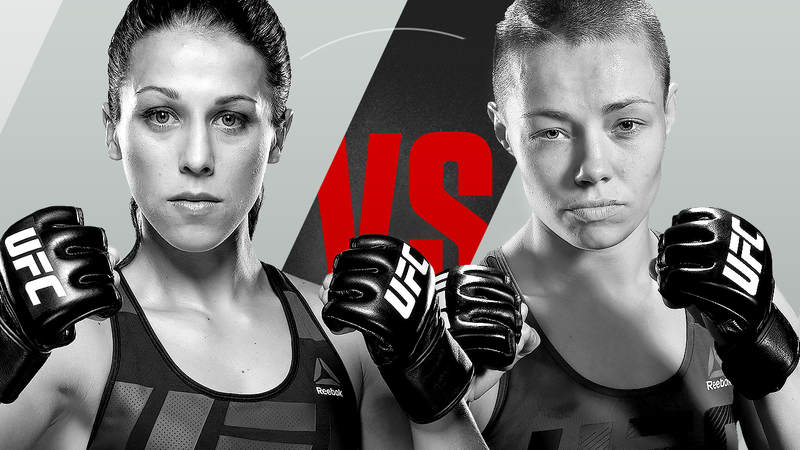 Joanna Jedrzejczyk will defend her strawweight belt for the sixth time against Rose Namajunas at UFC 217 on Saturday. 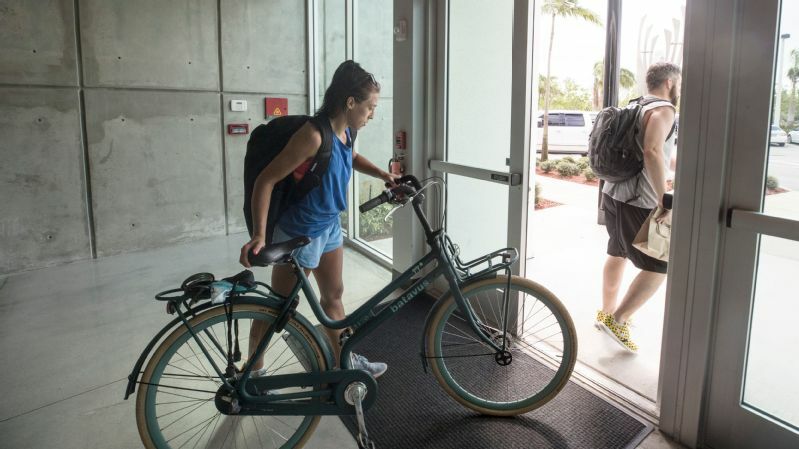 Joanna Jedrzejczyk climbs off her bike and wheels it through the doors of American Top Team (ATT), a mixed martial arts gym in Coconut Creek, Florida. She rides the four miles between her house and the gym more mornings than not. With her dark hair pulled up in a high ponytail that sits to the left side of her head, and fingernails blazed pink, she doesn't necessarily look like the dominant fighter she's known to be. As a strawweight, her stature isn't particularly imposing, and she projects kindness. She wears a royal-blue tank top and sky-colored shorts. She almost looks like she could be heading to the beach. Jedrzejczyk smiles and waves before giving fist bumps to everyone in the lobby. She stops to sign a fan's shirt and invites her to watch the morning's sparring session. Two massive posters hang on the wall, visible to all who enter the gym. One is from UFC 200, when ATT fighter and bantamweight champion Amanda Nunes first won her belt against Miesha Tate. The other is from UFC 205 -- the first UFC event at Madison Square Garden -- which featured Jedrzejczyk along with ATT teammate and welterweight champion Tyron Woodley. Jedrzejczyk, 30, no longer goes by her full name on UFC fight posters; now she's simply listed as "Joanna." Since being crowned the strawweight champion in 2015, Jedrzejczyk (14-0) has defended her belt five times. If she does so for the sixth time against Rose Namajunas (6-3) at UFC 217 on Saturday, the feat would tie Ronda Rousey's record of consecutive title defenses. Simply by stepping into the Octagon at Madison Square Garden this weekend, Jedrzejczyk will set the record for most title fights by a woman. "Everyone knows who Joanna is," UFC president Dana White says. That sentiment, though, really applies only to MMA fans. Yes, Jedrzejczyk has dominated her weight class since capturing the belt, vanquishing every top contender who crosses her path. But her ascendancy has been overshadowed, with much of her career happening amid Rousey mania. She has yet to achieve the kind of culturally penetrating celebrity attained by Conor McGregor or Rousey, and her fights don't carry the same frenzied sensation. Tying Rousey's title defense record and breaking her record of successful title fights just might prove that Jedrzejczyk is worth all hype Rousey received -- and then some. "Skillwise, she's light-years ahead," says Mike Brown, one of Jedrzejczyk's primary coaches. "I think Joanna should be just as big, if not bigger, than Ronda." Gezary Matuda, left, is one of the world's best Brazilian jiu-jitsu fighters and poses a challenge for Joanna Jedrzejczyk in training. After a quick change into training clothes, Jedrzejczyk starts her morning session by grappling with Gezary Matuda, one of the world's best Brazilian jiu-jitsu fighters. She has won three world championships in Brazilian jiu-jitsu, and her shirt reads "Greatest of All Time." "Every camp, I prefer to get beat up," Jedrzejczyk says. "[Matuda] has submitted me so many times, she and other fighters. They give me a lesson to be a better fighter." Jedrzejczyk and Matuda grapple from different positions, attentively observed by Brown's fellow ATT coach Vitelmo "Katel" Kubis. Jedrzejczyk on top. Matuda on top. They push and pull against each other. It doesn't look like much is happening, but the strain of searching for leverage is clear. Their ponytails are falling out, and grimaces pull at their lips. At one point Matuda climbs up Jedrzejczyk's back, pulling her against the wall. Matuda's forearm presses against Jedrzejczyk's neck. One of Namajunas' most dangerous tools is a rear naked choke submission. If Jedrzejczyk finds herself in a vulnerable moment in the Octagon on Saturday, Namajunas could end it with her elbow squeezing against Jedrzejczyk's throat. 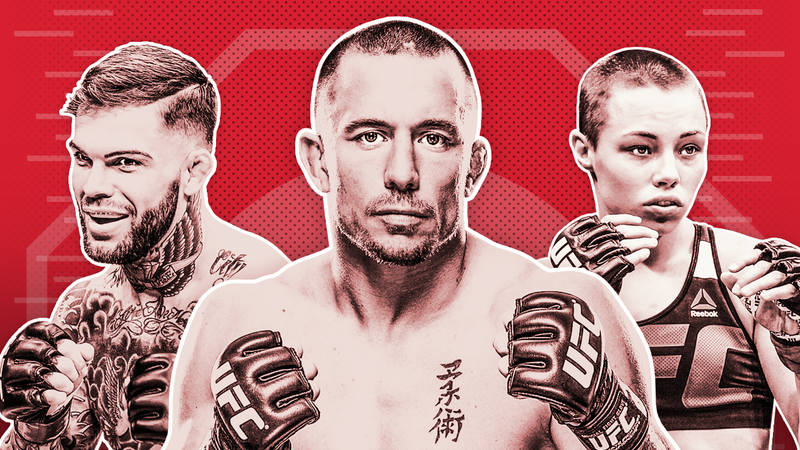 "If you give her your back for just a second, [Namajunas is] very good at jumping on and landing that choke," Brown says. "Even if she doesn't get under your chin, she has such a tight squeeze, it feels like it will dislocate or you can't get any air in." After each round, Jedrzejczyk sits and recovers as Brown and Kubis give additional tips and guidance. Brown demonstrates how he wants Jedrzejczyk to escape Matuda's hold, and the different ways she can get up from the floor. Though Brown says that Jedrzejczyk is a proficient grappler, it's no secret she's most lethal on her feet. Joanna Jedrzejczyk leads the entire UFC in strike differential at 4.44. For every strike her opponent lands, Jedrzejczyk lands 4.44 strikes. Working with athletes like Matuda is one of the reasons Jedrzejczyk came to ATT from Poland. This is her third camp with the gym, and Brown says that her takedown defense and wrestling have already improved significantly. What makes Jedrzejczyk so tough is that she's always improving. She actively seeks feedback and listens to her coaches. "I know fighters with 10 losses who are more closed-minded than her," Brown says. After finishing with Matuda, Jedrzejczyk spars with Chris Navarro, a bantamweight fighter who trains at ATT. The difference between the two sessions is evident. Against Matuda, Jedrzejczyk worked to better herself against a formidable opponent. Standing up with Navarro, Jedrzejczyk is clearly the advanced fighter. She pummels him with a flurry of punches, ducking out of the way as he tries to return the favor. Jedrzejczyk doesn't land the kind of hits that create a thunderclap of her fist connecting with his body. That's not really her style. Jedrzejczyk doesn't overcome fighters quickly. Though she's perfectly capable of winning by knockout or submission, her last four wins have all come by decision. She takes challengers the distance, wearing them down the old-fashioned way -- by continuously beating the snot out of them. Jedrzejczyk leads the entire UFC, regardless of gender, in strike differential at 4.44. For every strike her opponent lands per minute, Jedrzejczyk lands 4.44 strikes. Navarro catches his breath against the fence lining the sparring area. His chest heaves. Jedrzejczyk calmly allows Kubis to give her some water and accepts advice from her coaches. "She's so fast," Navarro says. "She's like a whip." More often than not, Joanna Jedrzejczyk makes the four-mile trip between the gym and her home on her bicycle. Jedrzejczyk lives with Paulina Discepolo Indara and Michelle Ingels, her nutritionists from Perfecting Athletes, in an unassuming, single-story home. Artwork collected from around the world decorates the walls, and the pots and pans Indara uses to prepare Jedrzejczyk's meals dangle from the shelves in the kitchen. Coconut and Jasmine, two Maltese dogs who also live in the house, rush Jedrzejczyk as she exits her room. Freshly showered after her morning training and subsequent bike ride home, Jedrzejczyk sits at the desk with her fresh cup of coffee -- a favorite indulgence. Coconut spreads out on the surface of the desk. In view is the Polish Women's Health magazine, which features Jedrzejczyk on the cover, as well as her book, "Wojowniczka." The title translates to "warrior." Poland is still Jedrzejczyk's home. Her family, most of her friends and her fiancé are there. And when she's home, there's a rigid media schedule that limits her relaxation time. When she retires, Jedrzejczyk wants to open a coffee shop and get a charitable foundation off the ground. Just a few months ago, retirement felt closer. The wear and tear of the fight game is real, but she feels the staff at ATT are the right people to help her keep growing. She still thinks about retirement sometimes. She actually thinks about it every camp as she puts her body through the wringer. During the hardest weeks, she thinks that this fight, whichever one she is prepping for, will be the last. It hasn't stuck yet, though. The high of victory is hard to shake. There are UFC opportunities actively pushing Jedrzejczyk forward. Earlier this year, the UFC announced plans to open a women's flyweight division (125 pounds), and Jedrzejczyk hasn't been shy about wanting to compete at that weight. To be clear, she has no desire to leave strawweight, but she wants both belts, something that has tempted multiple elite female fighters as the UFC continues to open new classes. Holding belts in two divisions is something no woman in the UFC has done. But the idea of that and breaking records have pushed retirement -- once seemingly on the horizon -- further away. 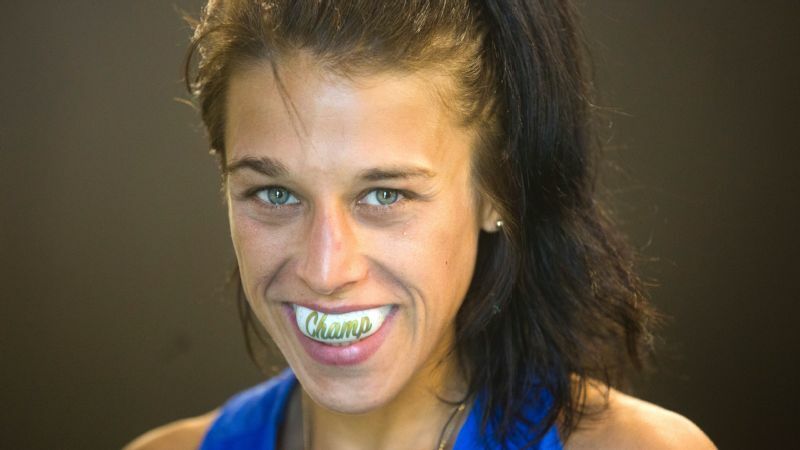 As long as her body holds up and she continues to have more good days than bad, there's no reason to think that "Joanna Champion" is going to hang it up anytime soon. "Today is a good day," she says, petting Coconut. Joanna Jedrzejczyk lives in Florida with her two nutritionists. But her native Poland is still home -- her family, friends and fiance are all still there. A longer career means more opportunities for losses, but Jedrzejczyk doesn't seem concerned. After all, she put her own undefeated record on the line when she stepped up at UFC 213 and offered to fight Valentina Shevchenko for the women's flyweight title after Nunes pulled out the day of the fight due to illness. It could have come across as a publicity stunt, as the possibility of getting all of the clearances to make such a fight happen was slim, but Jedrzejczyk was absolutely serious. "I only had one thing on my mind -- rescue the show," Jedrzejczyk says. "Go there and give people what they want. I knew that I was not in shape, but it wasn't important. I wanted to show to the UFC that I'm there for them, even if I was going to lose." "Fans love real fighters," White says. "People who will fight anyone, anytime. Joanna has that about her and people know it." Jedrzejczyk established her commitment to the UFC in her first title defense by stepping up to Jessica Penne on short notice after one of the headline fighters, Alexander Gustafsson, was injured. She won handily. To show his appreciation, White brought Jedrzejczyk into his office, where he had laid out 30 pairs of sneakers just for her. Jedrzejczyk could not believe the shoes were for her; she was taken completely by surprise. She told him to "never makes jokes about sneakers." To her, it showed just how much White cared. He could have gotten her any number of things, but he got her something he knew she'd love. "He showed to me that he knows me, that he knows his athletes," Jedrzejczyk says. The offer to fight Shevchenko echoed Rousey's decision to fight Holm in Australia at UFC 193. She was asked to rescue the card after Robbie Lawler injured his thumb, and she said yes. The chief difference, however, is that Jedrzejczyk was not asked; she volunteered to put herself and her record in that position. That is, perhaps, the primary difference between Rousey and Jedrzejczyk. Rousey's undefeated record and presumed indestructability were integral to her stardom, but she ultimately couldn't go untouched. McGregor has lost fights; so have Demetrious Johnson and Georges St-Pierre. Sports happen. People lose. One day, even Jedrzejczyk might lose. Though she thinks that is unlikely. "It didn't happen for Ronda, but I believe I will retire undefeated," Jedrzejczyk says. "I want this. It is my dream and my goal, and I follow my dreams. I make it happen." There was a time when retirement felt close for Joanna Jedrzejczyk. But there's still too much she wants to accomplish -- like achieving a title in two weight classes, something no woman in the UFC has done. "It's very rare to have an undefeated world champ in our sport because there are so many variables, so many small things can go wrong," Brown says. "The best fighter doesn't always win. One punch can change a fight. One submission can change a fight." Jedrzejczyk harbors a deep respect for Rousey. Rousey invited Jedrzejczyk to her wedding over the summer. Jedrzejczyk happened to be in Poland at the time, but the invitation, the honor of being asked, was special. Breaking Rousey's record would be special too. She remembers being 5-0, and just following the train to the next fight. "The time went by so fast," Jedrzejczyk says. "I didn't expect this." After finishing her coffee, Jedrzejczyk sits on a massage table for her session with her physiotherapist, Kamil Iwanczyk. She brings him from Poland so that he can work with her when she does her camps in the United States. She didn't have him for her first camp and she felt his absence. "He was the missing link," she says. Iwanczyk uses tools to scrape the tension from the muscles in her face, and massages the tension from the rest of her body. He pushes pointed rods against pressure points on her scalp, which Jedrzejczyk says activates nerves. She grimaces and scratches her head. This discomfort is just another bump along the road that Jedrzejczyk knows will feel better at the end. She views Iwanczyk as an investment in her body and in her career, one that she has no intention of wrapping up soon. "Not this year, not next year," she says. "For sure." If she wins this fight, and keeps winning, she has the ability to push the record book into the stratosphere for the time being. "She can go on a run that god knows how long it would take for somebody to break," White says. "She's going to go down as one of the greatest ever when she's at the end of her career." All she has to do now is beat Namajunas. Jedrzejczyk is resolved. "I want to give her nothing."